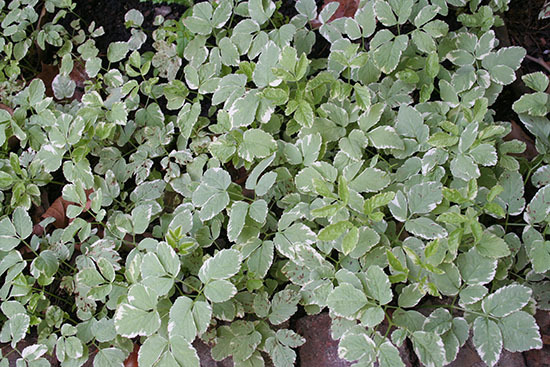 Every spring, I am asked about Goutweed, also known as Bishop's Weed or Snow-on-the-Mountain (Aegopodium podagraria). This plant isn't your typical weed but it is an aggressive groundcover that can be invasive and difficult to control. This Parsley family perennial was introduced from Europe and Northern Asia in the mid 1800's. In the middle ages, monks cultivated it for treating gout; hence the name. It thrives in moist, well drained soils in partial sun to full shade. It reaches 4-12 inches in height. The leaves, which rise directly from the crown, are compound with 3-9 ovate, toothed leaflets. Leaf edges are often white. Flowers appear in June typically, on 18 inch tall stalks. Flowers are small and white in dense, flat-topped clusters 3" wide, similar to that of its relative Queen Anne's Lace. Photo provided by James Theuri. Sold as a variegated groundcover, this plant will indeed fill in empty garden spaces and can revert back to one shade of pale green. However, when left to roam free with no barriers, this plant will grow with reckless abandon. Eventually, homeowners decide they've had enough and are ready for a change in their landscape design. Then the battle begins with controlling it. Goutweed is a tough one to eliminate. Remove flower heads prior to seeding so that seed production is prevented. Flowers should be cut and bagged. Plants can be dug up or pulled out of the ground. 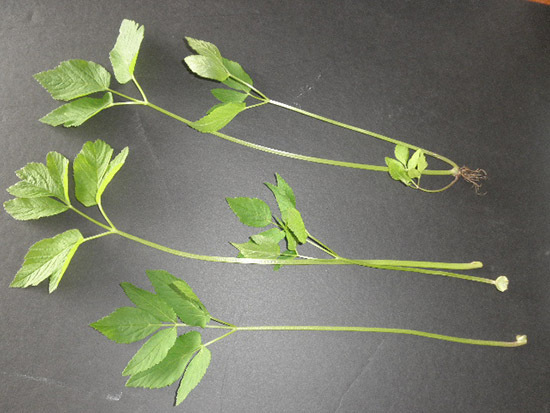 Rhizomes and pulled plants should be disposed of in the trash – not composted. Be prepared to repeat this process as any underground parts left behind can be rejuvenated and send up new shoots. Glyphosate can be applied in the spring or summer. Carefully read and follow all label directions. If the growth is older, a string trimmer could be used to first cut the plants short. Then wait a week or so for new growth. Spray the new growth; then keep a close eye on the area. Remove new plants as they appear. Other non-chemical options to try include covering the area with a landscape fabric or plastic. These options would be better for earlier in the spring however. Obtain good control before planting into the area. This may take a few weeks, a second application, a watchful eye, and patience. In the right setting, goutweed makes a nice groundcover. Still, careful monitoring of the population may be necessary. Years ago, I stumbled across this paragraph online which made me laugh so I saved it. The author had a small patch of it that she had been watching carefully. "Sometimes I wonder if I should have instructions, something like a living will, taped to the fridge. 'In case of my untimely demise, or if I develop a condition in which I am unable to do so for myself, I hereby state that my survivors or caretakers should eradicate the Aegopdium behind the Kousa as soon as possible.'" Just now a colleague jokingly suggested the notion of "passive aggressive gardening" for dealing with those "certain neighbors" we may unfortunately encounter from time to time. 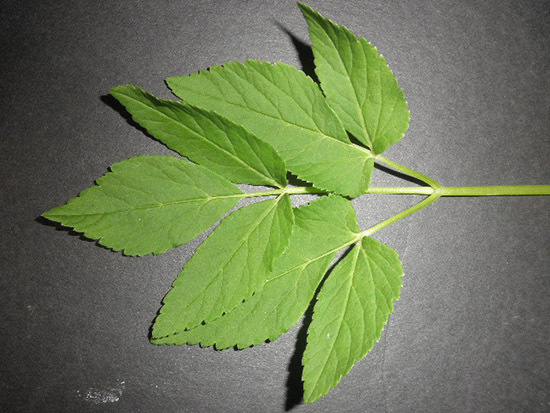 Goutweed, with its aggressive growth, immediately came to mind as a plant of choice for those particular circumstances. Here's wishing your plants and neighbors are not at all aggressive however.